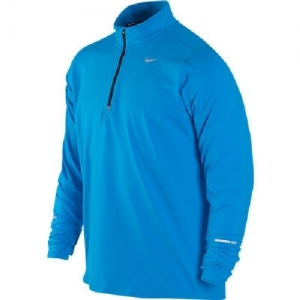 The Nike Element Half-Zip Men's Running Top combines sweat-wicking fabric, stretchy spandex and optimal coverage to help keep you comfortable on cooler days. Dri-FIT jersey fabric with a brushed face moves sweat away from the body to help keep you comfortable and dry while providing a soft feel against the skin. The half-zip design adds custom comfort while mesh underarm panels increase ventilation. Thumbholes at the cuffs add coverage and help keep hands warm.